Use the tools and messages below to leverage your social networks and spread the word about what XYZ Inc. offers employees. Remember to encourage candidates to say you sent them to make sure you get your referral bonuses. I work at XYZ Inc. and I want to pass along that we’re hiring. So if you’re looking for work that has value, good compensation, and an opportunity to be part of a great team, check us out! Visit https://www.mltgroup.com/ or contact us at hrassistant@xyzinc.com // (555)-555-1234 and please tell them I sent you! We’re hiring at XYZ Inc! If you’re looking for meaningful work with flexible schedules and opportunities for advancement, visit https://www.mltgroup.com/ or contact us at hrassistant@xyzinc.com // (555)-555-1234. And say I sent you! There are job openings at XYZ Inc. right now! Working with XYZ Inc. has been great for me. If you’re looking for meaningful work with flexible schedules and a good wage, visit https://www.xyzinc.com/ or contact us at hrassistant@xyzinc.com // (555)-555-1234. Be sure to say I sent you! My job at XYZ Inc. offers me holiday paymeaningful trainingexcellent benefitsreliable paychecksa chance to grow my skills , holiday paymeaningful trainingexcellent benefitsreliable paychecksa chance to grow my skills , and holiday paymeaningful trainingexcellent benefitsreliable paychecksa chance to grow my skills . If you’re looking for work that has value, good compensation, and an opportunity to be part of a great team, check us out, we’re hiring! Visit https://www.mltgroup.com/ or contact us at hrassistant@xyzinc.com // (555)-555-1234 and tell them I sent you! There are job openings at XYZ Inc. right now! Working with XYZ Inc. has been great for me. I especially like the great benefitsthe holiday paythe work life balancethe team I work withhaving a chance to grow my skills . If you’re looking for meaningful work with flexible schedules and a good wage, visit https://www.mltgroup.com/ or contact us at hrassistant@xyzinc.com // (555)-555-1234. Be sure to say I sent you! Please share your story re: why working with XYZ Inc. has been good for you. Write a brief testimonial to share on your social networks or to email to friends. Please include each of the parts below. Tip #3: Remember a ‘call to action’ asking people to consider applying or learning more about available opportunities with XYZ Inc.
I’ve always loved staying active and organized. Now, I’m getting paid for it! As a Warehouse Associate, I stay busy pulling orders and loading product. I love the challenging, fast paced work and knowing I’m an important part of the team. Sound good? You could be working here too; we’re hiring. Take a look at our site or contact us at hrassistant@xyzinc.com // (555)-555-1234 to find out how you can join our team! And tell them I sent you! 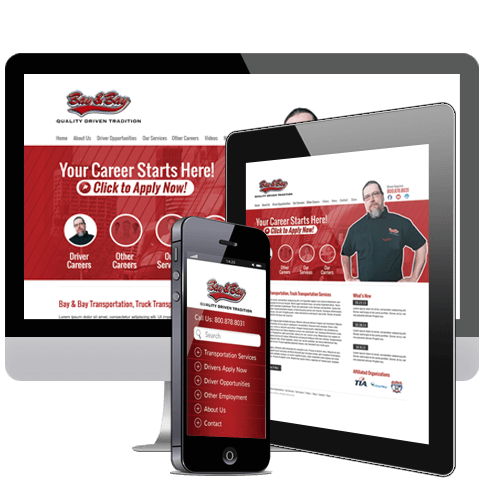 While working with XYZ Inc., I’ve learned skills that I can apply in other areas of life. I feel I’ve finally found a career I can be passionate about, not just a job I have to go to every day. I take pride in my work and the quality customer support we provide. You could be working here too; we’re hiring. Take a look at our site or contact us at hrassistant@xyzinc.com // (555)-555-1234 to find out how you can join our team! And tell them I sent you! XYZ Inc. is hiring! email at hrassistant@xyzinc.com and say I sent you! I work at XYZ Inc. and I want to pass along that we’re hiring. Email at hrassistant@xyzinc.com and say I sent you! 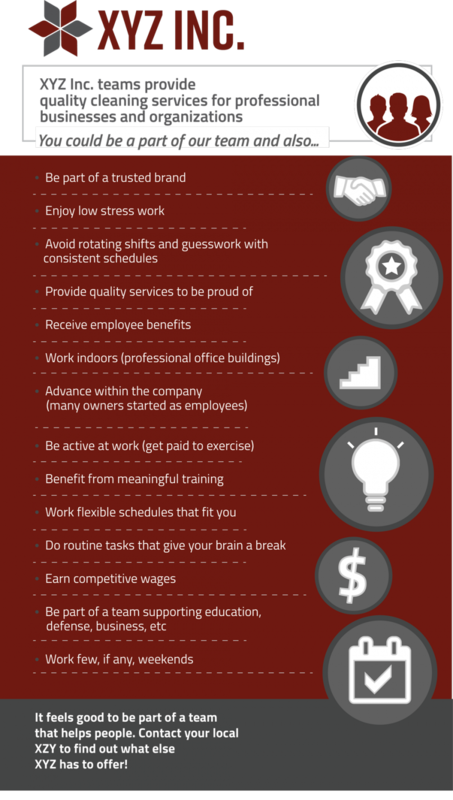 We’ve created infographics explaining employment benefits at XYZ Inc. Just post the infographic to your social network.